Our extensive higher education experience, impressive portfolio of projects and the fact that virtually all of our furniture is on NYS Contract and GSA make us a great source for higher education projects of all kinds. 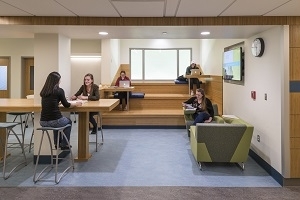 There are many special considerations when specifying furniture for colleges and universities. We only specify furniture from manufacturers experienced in high-use applications and strong, proven warranty policies. We know how important it is to provide you with furnishings and design that not only enhance the learning experience for your students and staff, but help you provide a safe, healthy and pleasing "living environment". View galleries of images from some of our past higher education clients. Classroom furniture and design should enhance the dynamic process of learning. The ability to accommodate many different teaching and learning styles, today’s classrooms must be versatile and comfortable. Residential life is a very important aspect of the college experience, and one of the major factors prospective student site in deciding which college to attend. A college library is more than a storage room for books, and it plays a very important role in the student’s experience – which is why it is a stop on nearly every college visit tour. Whether you administrative offices are located in new, state-of-the art facilities or historic old buildings, our team can design a very attractive workstation to suit your needs.